I have decided to hold a SPRING SWEEP OPEN competition this coming Sunday April 5th. I know its late notice but many anglers, me included, were disappointed when strong winds meant that The Greys Pairs had to be postponed last weekend. So The Spring Sweep will offer us a chance to get out and fish a friendly match whilst the season is still young. The Spring Sweep Open is an individual one day event fished from drifting boats to international rules. Like the name suggests it is open to everyone. It will be fished from 10am to 6:00pm and the total cost will be £45. That includes a full day 4 fish ticket, your boat hire and your entry fee. We will have a free buffet at the end of the match, where you can have a beer and ‘chew the fat’ with the other competitors. £10.00 from each entry will enter a central pot that will be split between the top three places as follows: 1st = 50% of Pot, 2nd =30% of Pot and 3rd =20% of Pot. The fishery will donate a tackle prize for 4th place and the best fish of the day. This entry was posted in Stocks Reservoir Fishing Reports on March 30, 2015 by staff. Sport: The weather forecast kept all but three bank anglers away today. They had a great days sport though with 18 trout between them. Nigel Simpson and John Connolly both fished black buzzers on floating lines in Hollins Bay to take eight a piece. They both commented that some of the trout took the buzzers as soon as it had landed on the water. Amongst John’s catch was a cracking brownie of 6lbs+ and seven rainbows to 3lbs. Tony Manning was the third angler who caught a nice brace on Dawson’s Olive. Karen Flemming with an 8lb Bank House rainbow. Following the cancellation of the Greys Pairs comp’ that was scheduled for today there was a poor turnout of anglers at Stocks today. This having been said the weather forecast was very poor and the weather was indeed quite vile. We had two boats on the water and two rods fishing from the bank. Despite the wind and the rain fish were found and good sport was enjoyed by all. Sheltered from the wind Newclose Bay, Ben’s Beach and Hollins Bay were the targets. The successful method was pulling a variety of lures, with blacks and greens working best. See you next time, Nick. This entry was posted in Stocks Reservoir Fishing Reports on March 29, 2015 by staff. Sport: It was very windy at Stocks today with white horses across the water. Four hardy anglers ventured out on the boats and there day was cut short as the wind really picked up in the afternoon. They caught fish though. Bernard McBride and Lloyd Edwards had 8 trout to the boat on cormorants and boobies, they fished at Willow Island and later in Hollins Bay. R Stevenson and Ashley Temple stuck it out behind Willow Island to take four good fish and they had the chance for a few more. Their best fly was a black nomad. On the shore three bank left without handing a return in, so I’m not sure how they finished up, but Dave Zalens fished for a hour down in Hollins in the afternoon. Dave fished a cats lure to catch two, drop two and he had several follows. This entry was posted in Stocks Reservoir Fishing Reports on March 28, 2015 by staff. 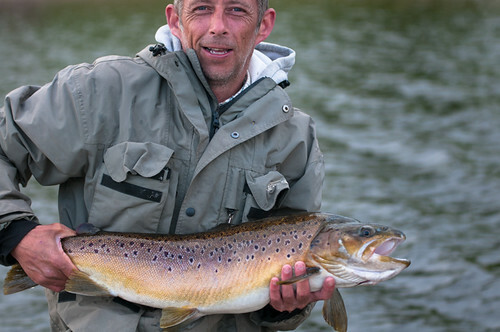 Sport: Ken Whiteside had a great half day session with trout from Bell Point. Ken fished a floating line with a yellow damsel on the point. He found the fish no more than 3 feet down and had a lot of other pulls that didn’t stick. On the boats George Ashton and Jose Vallerino fished off both islands with intermediate or tip lines to bring 23 fish to the boat. Their best flies were nomads but they picked up some of their trout on buzzers fished on the droppers. This entry was posted in Stocks Reservoir Fishing Reports on March 27, 2015 by staff.